The orders will be in preparation process after receiving the payment through any of the methods of payment offered by Wilden Militaria S.L.. The preparation time of the order will depend on whether there are custom, special size or on demand items. In this case read the description of the articles or send us an email to (contact (a) wehrmacht.es). Painted helmets with decals or not. Orders will be shipped within 2 or 3 business days if there are none of the items mentioned above. The shipping tracking number will be provided by email to the buyer to check the status. If the order is returned, must pay again the shipping charges. If a shipment is refused, buyer is responsible for any fees associated with the returned package. In case of package re-routing or of an incomplete/incorrect shipping address, there is a charge for address correction. 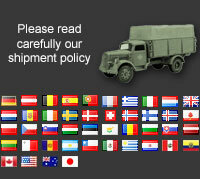 You are responsible for assuring that the product can be lawfully imported to the destination country. When ordering from Wehrmacht.es, the recipient is the importer of record and must comply with all laws and regulations of the destination country. Orders that are shipped to countries outside of European Countries may be subject to import taxes, customs duties and fees levied by the destination country. The recipient of an international shipment may be subject to such import taxes, customs duties and fees, which are levied once a shipment reaches your country. Additional charges for customs clearance must be borne by the recipient; we have no control over these charges and cannot predict what they may be. Customs policies vary widely from country to country; you should contact your local customs office for further information. When customs clearance procedures are required, it can cause delays beyond our original delivery estimates. You have 48 business hours from delivery day to contact Wilden Militaria S.L. to report product damage or failure and request a return/replacement. Shipping can only be refunded if the return is a result of an error by Wilden Militaria S.L.. Shipping charges and collection should be paid by the customer. To obtain this refund, the product must be in original packaging if applicable and in perfect condition. Do not pay any item not arrive in perfect condition. To make a refund, send us an email prior explaining the causes. Once we receive the goods and previous verification of status, we will proceed to refund the amount excluding shipping and according to the method of payment by the customer. We don't send outside Spain Blank Firing or BB's Weapons. Only for Spain, Portugal and Andorra.